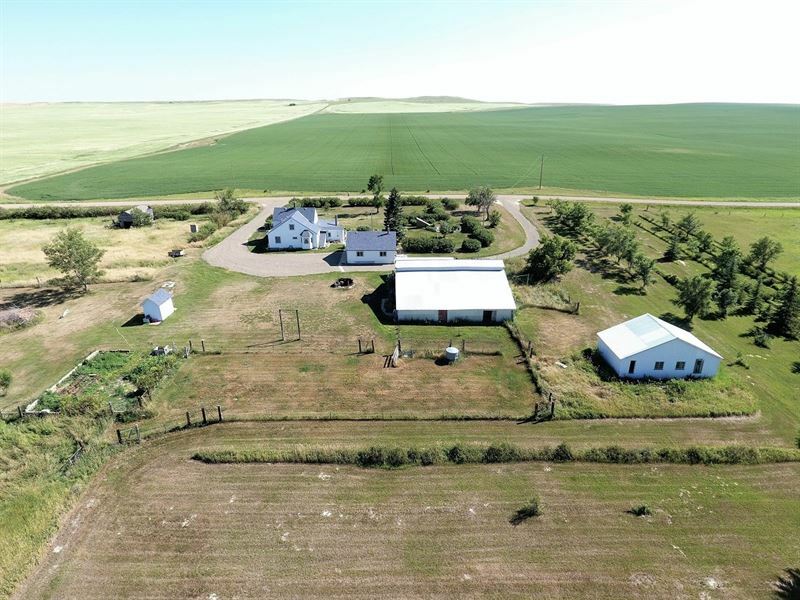 True country living at its best is what awaits you and your family on this 22.5 acre hobby farm located outside of the small community of Bloomfield, Montana. The property includes a 1.5 story recently updated farm house, detached double stall garage, barn/granary, machine shed/shop, garden shed and two separately fenced pastures. The 1480 sq' main level of the home houses the living room, kitchen, formal dining area, office, family room, master bedroom and full bath. The living room features large windows for tons of natural light and a wall with a propane fireplace, built in bookshelves and closed cabinetry for storage. The custom built country kitchen has tons of cabinets and countertops, built in breakfast nook, original hardwood flooring and includes a gas stove, dishwasher, refrigerator and microwave. The formal dining area features a built in china cabinet with plenty of storage and hardwood flooring throughout. An office that sits between the living room and family room could also be converted into an additional bedroom if needed. The family room has ceramic tile flooring, wood stove and in floor heat for cozy warmth during our cold Montana winters. The master bedroom has a walk in cedar lined closet and access to the main level bathroom which features a ceramic tile bath surround and floor. The 720 sq' upper level of the home has 3 bedrooms and a 3/4 bath. The partially finished 960 sq' basement has 2 bedrooms, both with in floor heat and plenty of storage. The remaining basement houses the utilities, work shop area, pantry, sink, and stove which is ideal for canning all your homegrown fruits and vegetables. The homestead has many outbuildings, garden and a landscaped yard with tons of foliage to include perennials, raspberries, strawberries, apricot and apple trees. A 784 sq' oversized double stall garage has power, stove and work benches. Bring your chickens, goats, pigs, horses, cows and more because this granary/barn has plenty of space for all. The barn has various rooms that can be used for poultry and small animals and stalls for the large ones. The fenced pasture land is split into 2 sections and can be grazed or hayed as it is planted with a grass/alfalfa mix. For your equipment storage there is a machine shed that is nestled in the treed shelter belt. If your looking for wide open spaces under the big sky and amber waves of grain you have just found your home where the deer and the antelope play.